Lee is lonely with no one to play with but her grandmother until she meets a lobster who speaks in rhyme and only wants his freedom. This picture book, published on Prince Edward Island, is a story of life in an Atlantic Canadian fishing community. Author Deirdre Kessler is a resident of Prince Edward Island. Lee lives in a small Maritime fishing village with her grandmother and is often lonely because there are no other children around to play with. Out on the boat one day, Lee hears a cry for help, and discovers a talking lobster. Lee and Lucky the Lobster become fast friends, and when Lee is swept off the wharf in a storm by an ocean wave, Lucky comes to the rescue. "Standing on her parents' Cape Islander boat, the Anne-Marie, Lee watched the lobsters in the crates. She felt sorry for them. They'd been caught and taken from their underwater homes. Their front claws had been banded with thick rubber bands. Now they were climbing over one another in confusion. Suddenly Lee heard a little voice. Oh, please, set me free! Set me free! I'll show you a secret of the sea! I'll tell you how lobsters came to be! Oh, please set me free! Set me free!" (8-9). 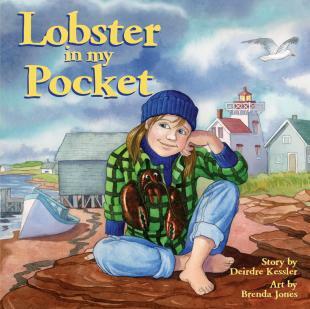 Multiple Editions/Illustrations: Lobster in my Pocket was first printed in 1987. The illustrations that accompanied the text were gray, white, and blue line drawings. The re-publications of the book in 2002 and 2010 include full-colour illustrations. According to reviewer, Nancy Tully, "Brenda Jones depicts the characters realistically while using a pleasing pastel palette for the Maritime setting. The dark brownish red lobster stands out prominently against the more muted background of the fishing village" (Canadian Materials Magazine). Reviews: Tully, Nancy. "Review of Lobster in my Pocket." Canadian Materials, 16.1 (1988). Junyk, Myra. "Review of Lobster in my Pocket." Canadian Materials, 27.8 (2010).